I still struggle calling myself a runner. Yes, even after a half marathon I question whether I deserve the title. 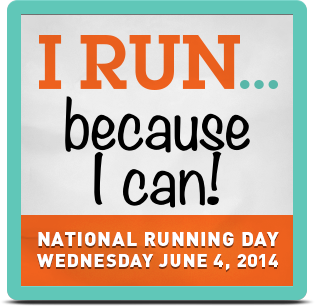 I run because it burns a lot of calories and because I love the feeling afterwards. Even though my runs are a struggle, and I hurt during and after, I love that feeling of being drenched in sweat. I still run slow. I will probably never run fast. I don't care. I run because it wasn't that long ago that I couldn't run. I was carrying so much weight that running was just not a smart choice. Now I run because my legs work, damn it, and there a lot of people out there who have actual excuses as to why they cannot. I don't have excuses. I didn't have a lot of spare time yesterday due to a 12 hour work day, but I took a half hour in the afternoon and ran a few miles and then walked back to campus. I had the new Miranda Lambert album Platinum to keep me entertained, and it was a nice little break in the day. I am glad I got to participate in the day!